Budgeting and accounting might not be the sexiest thing to talk about; in fact, a Listen Money Matters survey found that 0% of successful relationships began with a conversation about accounting software. Miss him, don’t ya? Accounting for our profit and losses will give us a much clearer picture of our financial health and will help inform our decisions on how to improve our financial situation. If you’ve decided to start using accounting software to track your expenses, create a budget, manage investments, and improve your overall financial situation, you may have already done some research into the different options available. Some of the most popular programs are Personal Capital, Mint, Quicken, and You Need a Budget (YNAB). But what types of features do these different accounting software options have, and how do they stack up against one other? Below we provide you with the ultimate guide comparing these financial tools, including Personal Capital vs. Mint, Personal Capital vs. Quicken, Quicken vs. Mint and YNAB vs. Mint. Let’s get started with an overview of each. Personal Capital provides financial management services to more than 1.6 million users. It’s a free service that allows users to link all their financial accounts and manage their debts and assets from a single dashboard. The software tracks and categorizes spending to give users a clear picture of their net worth and financial standing. Personal Capital also links to investment portfolios and retirement savings accounts to help users stay on track with their long-term financial goals. As part of its service, Personal Capital enables users to communicate with financial experts who can offer advice about their investments and help optimize their finances. Mint is an all-in-one money management tool. Some of its features, including bill tracking, budgeting, and investment tracking, are similar to those found with Personal Capital. However, Mint also offers free credit score monitoring, allowing users to get their credit reports quickly. It also provides daily credit monitoring so that users can keep track of any changes to their scores. You can view your Mint financial dashboard on your desktop or on your phone or tablet with a mobile app that’s available for Android and Apple devices. Those who are looking for alternatives to Mint often turn to Quicken. This software also provides users with an array of financial tools in one simple dashboard, but it differs from both Mint and Personal Capital in that users must pay for a subscription to the software. There are different products available, and each comes with different features. The basic product has budgeting, bill management, and account integration, while the premier product offers free bill payment and tax and investment management, among other services. You Need a Budget (YNAB) is another commonly used tool for people looking for Mint alternatives. 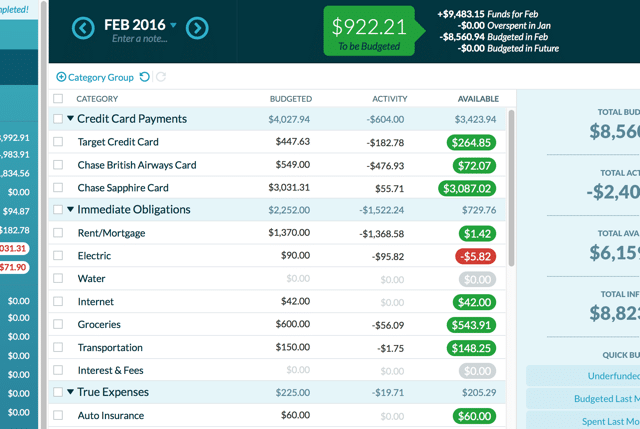 It encourages users to focus on intentionality when it comes to their finances. 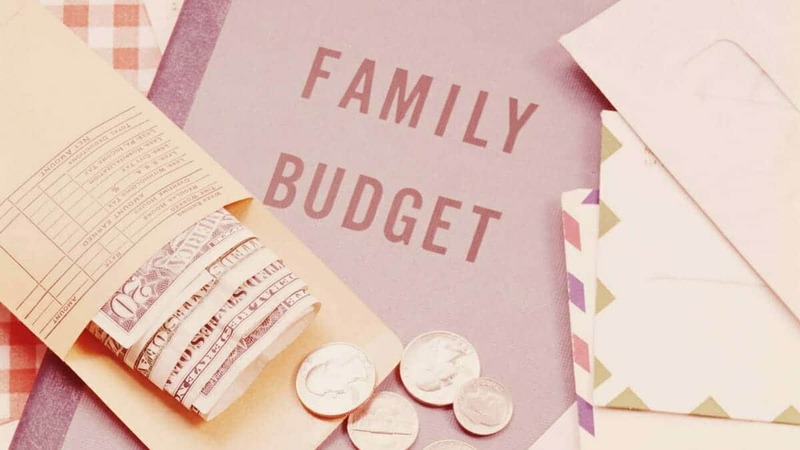 The software features a number of billing, payment, and planning tools that encourage financial stability and help users eliminate their debt. YNAB syncs with accounts and displays goals and progress in a variety of iterations. Users can also receive financial advice and tools through free video workshops with financial experts. YNAB is a paid service that has one flat monthly rate. Although Mint has long been one of the most popular financial tools, it is not necessarily the best choice for individuals who are truly looking to get a handle on their finances. When considering Personal Capital vs. Mint, one of the primary considerations is the different features each platform delivers. 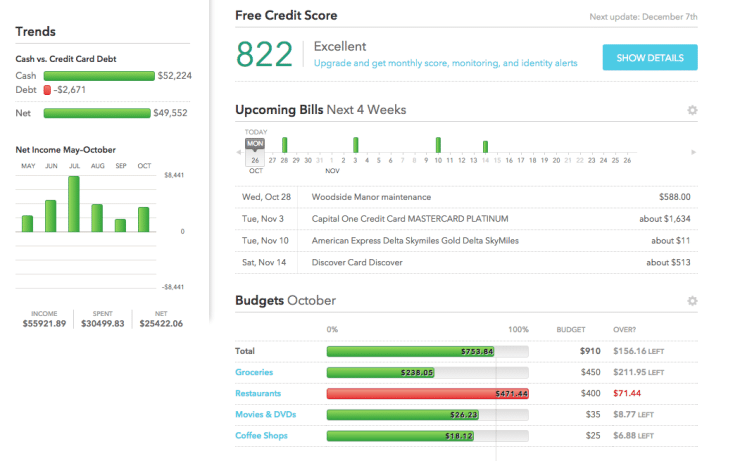 Personal Capital and Mint both have financial dashboards with the monitoring of budgets, expenses, and savings. However, Personal Capital also offers investment monitoring. Because of this, many users find that Personal Capital is a more comprehensive financial tool. On the other hand, Mint provides users with credit report monitoring, along with an optional paid credit reporting service. Another important factor when evaluating Mint vs. Personal Capital is the monetization of advertisements. Mint generates revenue by selling banner ads and recommending service slots on its website and applications. Personal Capital monetizes its service by offering paid financial advisory services, which allows the application to run ad-free. So, who is the winner when it comes to Mint vs. Personal Capital? The fact that Personal Capital enables users to track retirement plans and investments, in addition to standard billing and expenses, makes it preferable for individuals who are looking for a truly all-in-one financial management dashboard. Personal Capital pulled ahead in the evaluation of Mint, but what about Personal Capital vs. Quicken? Both services allow users to monitor their savings and investments. They provide the ability to plan retirement savings and determine whether the user is on track to meet his or her savings goals. For an added fee, users of Personal Capital can also access financial advisory services, a feature Quicken does not currently offer. Perhaps one of the most telling aspects of Quicken is not its financial planning, but rather its markedly declining usership. The tool has been around for decades and, although its interface has been changed for more user-friendliness, it is still a primarily desktop-based application. Users cannot access all the tools available via desktop-based Quicken on their mobile devices, which might explain its decrease in popularity. Today’s users want to be able to monitor their financial information quickly and conveniently. Personal Capital’s application gives it a significant advantage when evaluating Personal Capital vs. Quicken. 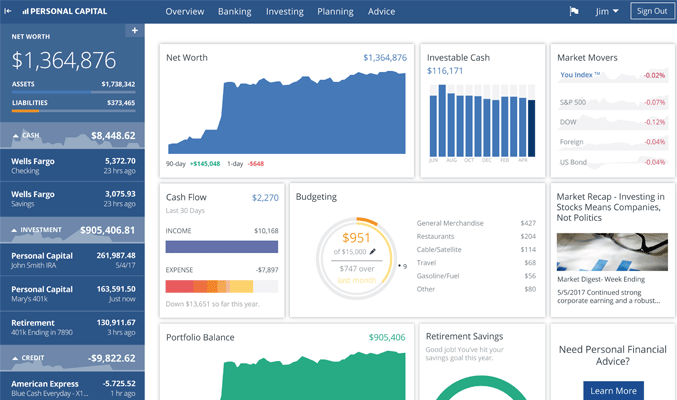 Personal Capital pulled ahead of both Mint and Quicken, but how to these dashboards stack up when compared to one another? When looking at Mint vs. Quicken, it’s important to consider accessibility. Mint has worked to optimize its accessibility for users, and the interface can be easily pulled up online on both Macs and PCs — and on mobile apps for Apple and Android. While the tool is online, it is always kept up to date and users don’t have to worry about downloading more recent versions. 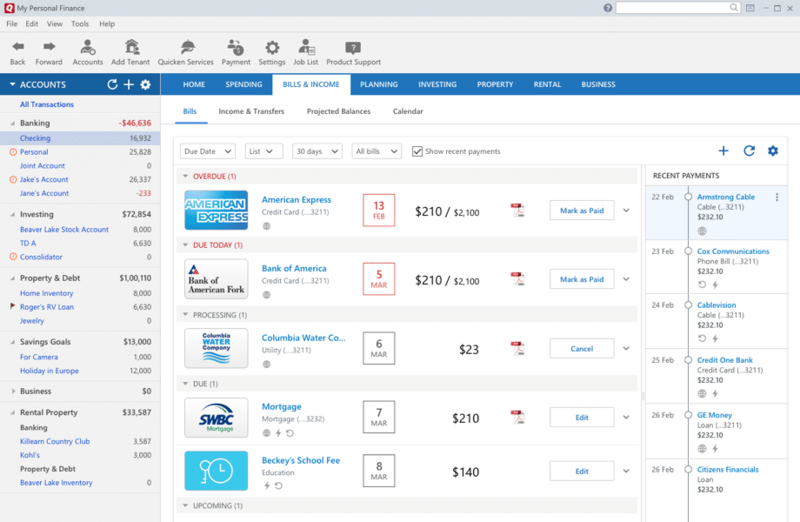 With Quicken, users must download the software and the dashboard is mostly limited to desktop use. One feature Quicken offers that Mint does not is check printing, which can be useful for users who write checks often (including business owners). But honestly, who uses checks anymore besides Granny at Christmas? 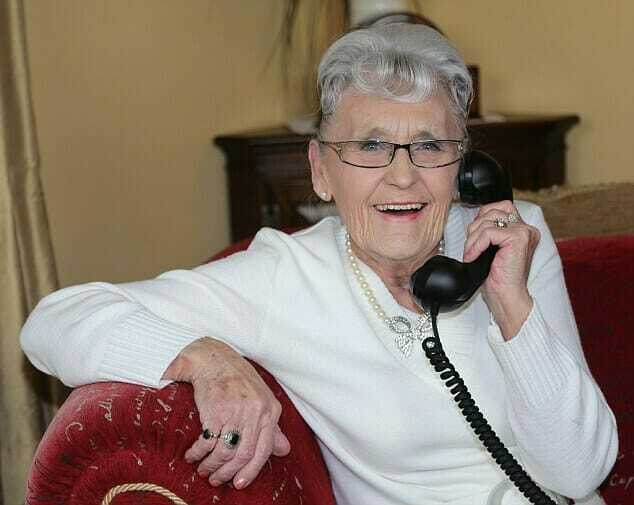 We love you Gam Gam! 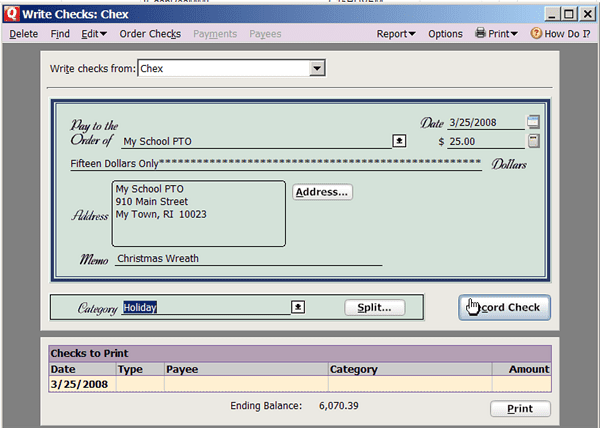 Users can also save receipts and other documents through Quicken, another feature that Mint does not currently offer. In the contest of Quicken vs. Mint, the price is also a major factor. Mint is a free service, while Quicken is a paid software subscription. With price in mind, in addition to the overall accessibility of the interface, most would agree that Mint wins out over Quicken. YNAB is one of the most viable alternatives to Mint. Both financial services offer budgeting, access to multiple devices, account integration, and a smartphone app. The most significant differences between Mint vs. YNAB have to do with the services for which each tool specializes. While Mint is a comprehensive interface that provides users with many different financial monitoring services all in one place, YNAB takes a different approach. Rather than trying to do everything, YNAB focuses on doing one thing — budgeting — to a high degree of excellence. Users agree that YNAB’s budgeting tools are superior when considering Mint vs. YNAB. Even though different aspects of Mint and YNAB will appeal to different users, the advantages that each service provides make them a pretty even match. There is no clear winner when it comes to YNAB vs. Mint, although users may have a better experience with one over the other. YNAB is an especially viable option for individuals who are looking for comparable Mint alternatives. Whether you are a Mint user looking for quality alternatives to Mint, or you’ve never used a financial planning service before, trying out a few different options can be beneficial. Begin by determining your goals and priorities. Do you want an easy way to monitor your investments, a streamlined budgeting dashboard, live credit reporting, debt management or a combination of these services? Which features are the most important to you? If you are primarily concerned with budgeting, billing, and spending, give YNAB a try. For comprehensive retirement monitoring, sign up for Personal Capital. Are accessibility and a user-friendly interface your main concerns? Mint may be your best bet. One size does not fit all, and your choice of financial service should be compatible with your needs as a user, as well as your assets and financial goals. Be sure to take stock of the specific things you need from a financial service so that you can make the best choice possible. Regardless of whether the financial tool you use is at the top of our evaluation or not, the most important thing is that your financial needs are being met. Based on our analysis of Mint vs. Personal Capital, Personal Capital vs. Quicken, Quicken vs. Mint and Mint vs. YNAB, we recommend exploring Personal Capital. The fact that Personal Capital is free, comprehensive and user-friendly makes it a clear choice among users who are looking for Mint alternatives and want to easily monitor their budgets, investments and net worth. Still, every user is different, and it’s important to invest some time into researching your options and determining which one is best for your specific needs. And always remember, no one wins when you talk about accounting software during a date. No one.